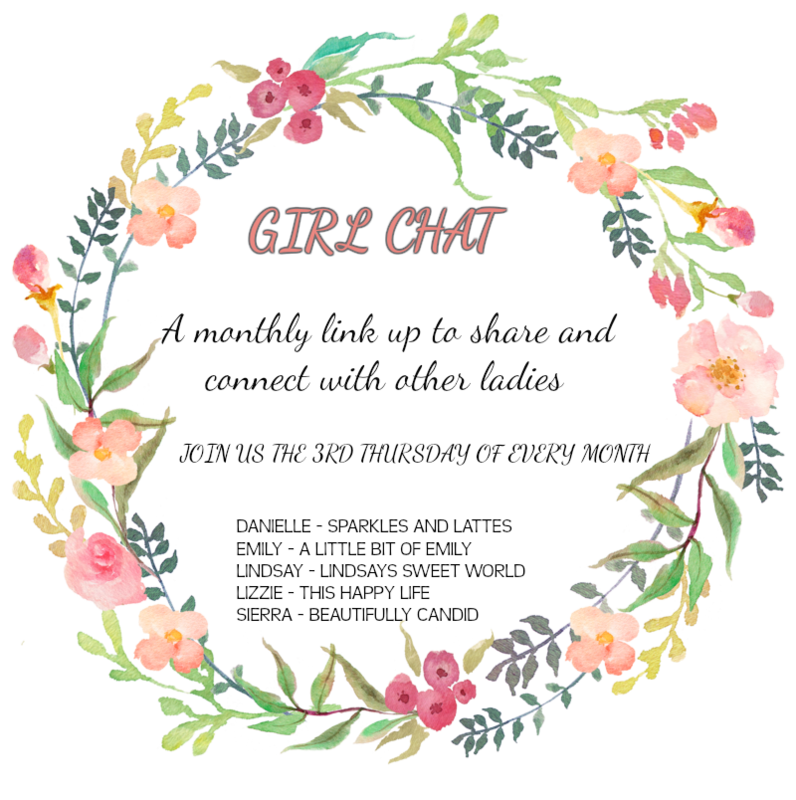 It's time for another round of Girl Chat. 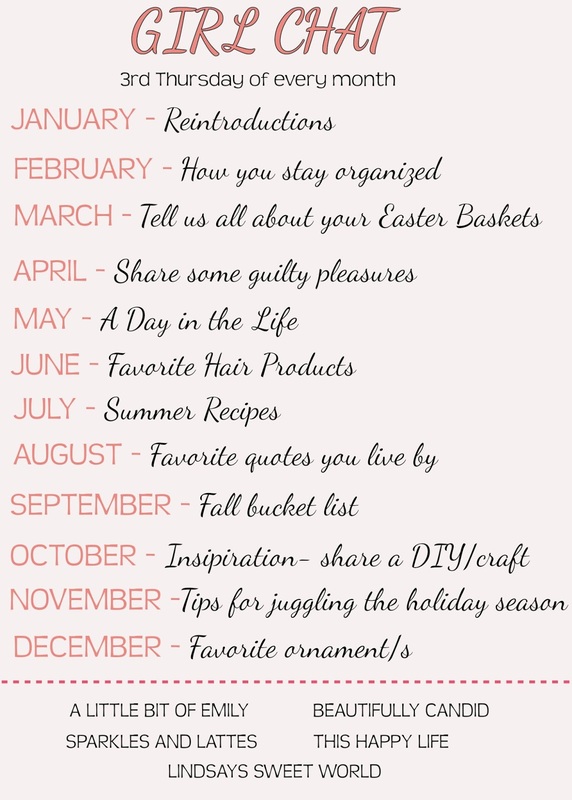 This month we are talking about Ways To Stay Organized. Grab the button below and come back here to link up. Anyways, there are some things that I do to stay organized. My main way of staying organized has to do with my phone. I use the Notes and Calendar apps on my iPhone. These save my life. I use my notes app for everything. From writing my grocery list to keeping track of the girls height/weight to blog ideas, I write it all down in my notes app. Blogging ideas come to me at random times (especially sitting in doctor's offices) and I open up my notes app and add it to my ongoing blog ideas note. I currently have 43 notes in my notes app. I seriously use it all the time. I also use my Calendar app for everything. I set reminders to do something, like blog, pick up a prescription, pick up juice and goodies for the girls Valentine's Day party, etc. 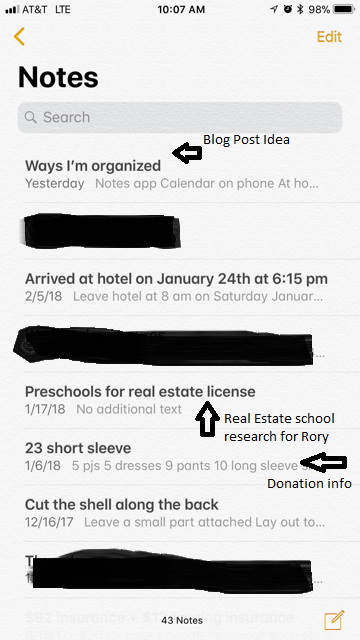 I also add in all my daily activities, appointments, basketball games that Rory attends (to not double book), birthdays and everything in between. I feel like this is the only way to stay up to date with everything and make sure that I don't miss anything. 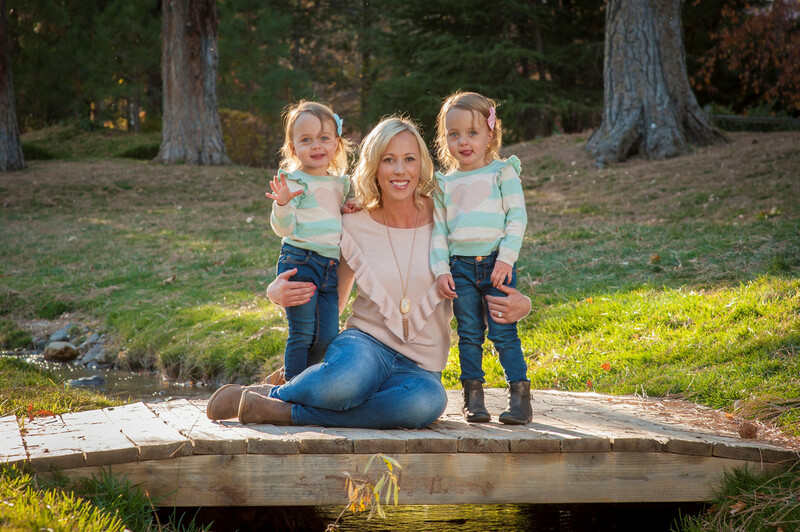 To stay organized in the home, I do a seasonal purge of clothes (for the girls and myself). I usually separate the clothes into two piles: one for donation and one for selling. I will admit that I haven't done my winter/spring purge yet, but I have done it for the girls. Another way I stay organized in the home, is buying simple things like a shoe organizer. I never realized how many shoes my girls had until this last weekend when I vacuumed the house. I used to keep their shoes tucked under their dresser, so they could grab them easier. But this weekend, I realized that their shoes were overflowing to both sides of the dresser as well. So I headed out and bought the girls a behind the door shoe organizer. Total old school, but amazing for saving space. Now in order to become more organized like Lindsay, I need to buy some folders for the girls art work. I want to keep the special ones, take photos of the ones that I will recycle (thank you Lindsay for that idea) and give some to the grandparents. I also have a few other things that I want to implement around the house. How do you stay organized? I can't wait to read everyone's and get some ideas! Amen to that - Lindsay is the queen of being organized! I use the notes app a lot, too. Mainly for gift ideas / wist list / books to read list! Oh dang. You have me totally beat on that. I love my notes app! Hope you are having a great day as well! This reminds me I need to do a seasonal purge soon here!! I also use the notes app for EVERYTHING! Love my calendar. T use the notes app as well for some things, but could probably utilize it better. I'd like to use my notes app more but I'm more of a pen and paper type! I have two over the door shoe hangers for all my shoes as my whole house has only one closet and it is not big. I have so much stuff in my notes app too, but I am a paper girl, I keep everything in my planner. If I lose it, I am screwed, lol! Girl, you are so sweet!! I have to say that I am loving all of the purging going on! And we do seasonal clothing purges for the kids, too. I never did the one after this past summer, though, so both of their closets are overflowing! You are very welcome. You are seriously organization goals!!! It is definitely time for me to do one. If I didn't use my calendar I would be LOST! My notes and calendar app are definitely two of my most used apps on my phone too! 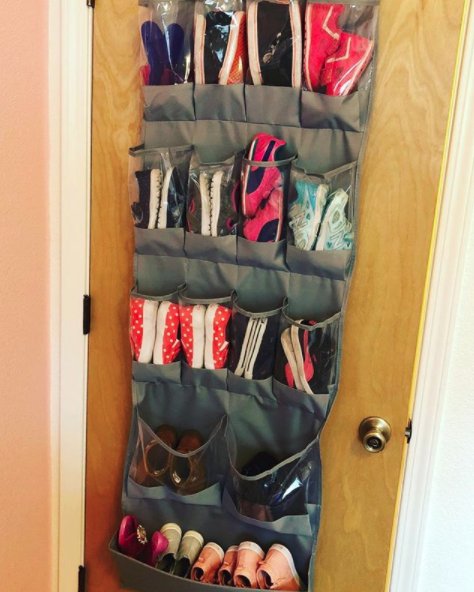 The shoe organizer is such a good solution for saving space and keeping things off the floor! I do love my Note app too - I keep all sorts of lists for each store I know i need to go to. I'm always forgetting stuff. I use the notes app for everything too! I have 52 right now. I had gone through and deleted some recently haha. And the calendar on my phone is where all our appointments and things i need to remember go, using alerts a day or hour ahead to remind myself! The purging is such a good idea! 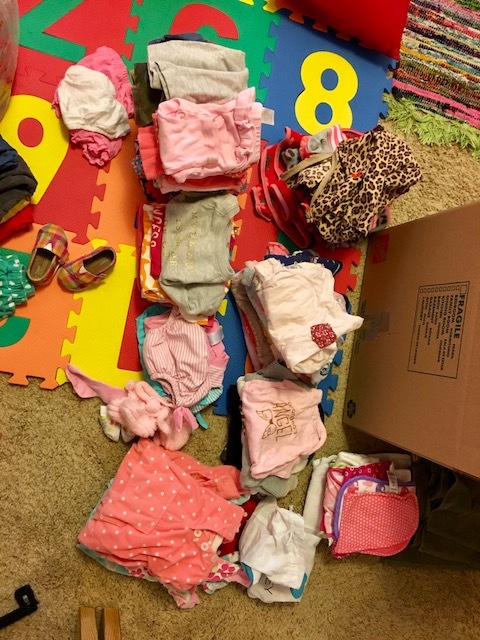 We're not sure if we'll have more kids yet so we hold onto most of the girls' clothes but I love the idea of rotating everything and cleaning by season. I am all about organization! I cannot have things feeling like chaos. I have to use the notes app on my phone for stuff as well but the reminder app is one I use more often. I like how it can let you know something when you arrive at a certain place, like when you get to the grocery store or work.